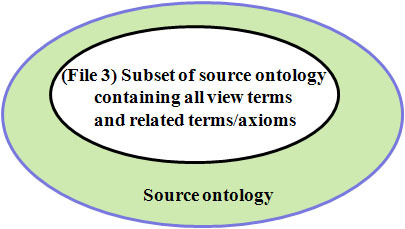 Microsoft Excel or tab-delimited text files can be used by Ontodog as the input file of terms selected from a source ontology to be used as the basis for an ontology community view. The input term file typically lists all the classes and object properties in an ontology that is used as the source ontology. The figure below shows an example of the input term file. The order of the content in these columns is important for generating the expected ontology community view files. The column names are given to help the users identify the content in the names. However, the names of the columns do not matter. Most ontologies continually develop and change. Views of an ontology may need to be updated as a result. To go through all the terms of an ontology for each update is a lot of work. Therefore, the tool also provides the functionality to list terms from the version to be used to generate the view that differ from the one available in the Ontodog. 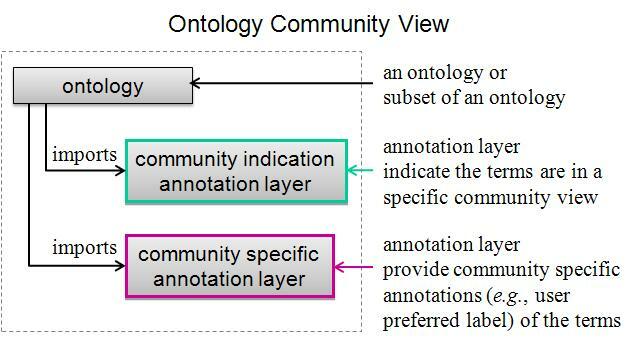 Ontodog can generate various annotation layers and subsets of the source ontology owl files needed for the ontology community view. The output file 1 is the annotation owl file that uses an annotation property (default is obo:inSubset, http://www.geneontology.org/formats/oboInOwl#inSubset) to specify the terms in a specific view. The figure below shows how the inSubset file looks like. The annotation value is used to indicate a specific ontology community view, e.g., FGED refers to the ontology community view for Functional Genomics Data Society. "Annotation Value" is a required input to generate output file 1. The output file 2 is the annotation owl file that uses the annotation property to add the user preferred labels to the terms in a specific view. The figure below shows what the user preferred label annotation file looks like. The user preferred labels for the terms should be provided in the column D (or 4) in the input term file. The annotation property used for user preferred label is required for generation of output file 2. We recommend creation of a subproperty of IAO:alternative term in the source ontology for this purpose. However, it is not required. Ontodog will use the annotation property URI or create a new annotation property using the label given by the user. The output file 3 is the subset of a source ontology containing all the view terms and related terms and axioms. So, it keeps full inferrence power of the source ontology. Ontodog can generate the fully inferred hierarchy version of the subset ontology. The subset of the source ontology can include all the individuals of a class if required. The above figure shows the view owl files displayed in Protege. The left panel is the subset of OBI (FGED_subset.owl). The right panel is the subset of OBI owl file imports the inSubset annotation layer (FGED_insubset.owl). With the imported owl, the terms in the FGED view is tagged with inSubset annotation with value "FGED" (in green box). The above figure shows the view owl files displayed in Protege. The left panel is the subset of OBI (FGED_subset.owl). The right panel is the subset of OBI owl file imports the inSubset annotation layer (FGED_insubset.owl)and user preferred label annotation layer (FGED_label.owl). With the imported owl files, the terms in the FGED view is tagged with inSubset annotation with value "FGED" (in green box) and with FGED community preferred label "strain, cultivar, or ecotype" (in pink box). The above figure shows the source ontology OBI with imported view inSubset owl files displayed in Protege. With the imported owl files, the OBI terms in different views are tagged. Term 'assay' is included in FGED community view and a OBI core term as well (shown in green boxes).